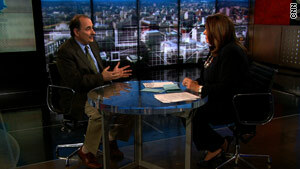 David Axelrod's comments on U.S.-Israeli relations were notable, but not quite soundbite-able, Crowley says. Washington (CNN) -- We interrupt the Sunday programs with this just in: President Obama took a dark-of-night, secret journey to Afghanistan for talks with Afghan President Hamid Karzai and a salute to U.S. troops. Meanwhile, back on the set, Washington was in the dark, or left in the dust, whichever you prefer. At any rate, no one knew about the trek until most of the shows were over and the president landed in Kabul, making coverage of the story limited. So, notable -- but not quite soundbite-able -- this Sunday: Check out senior White House advisers David Axelrod and Valerie Jarrett on U.S.-Israeli relations lately. It sounds like they are dialing back the public expressions of U.S. anger at Israel for approving additional construction in disputed territory. It's pretty nuanced, if real, but it IS the Middle East we're talking about. I'm half-expecting calmer, nicer and less-tense pronouncements as we head into Easter week. But Sunday talk was mostly domestic -- health care reform and the civility of the debate thereof. Turns out the health care reform debate didn't get settled; it got moved to another venue: from the legislative arena to a wholly political one. Sen. Lindsay Graham, R-South Carolina, called the new law a "house of cards ... a Ponzi scheme ... (that will) blow up the deficit." Also, he doesn't like it. Video: Fed student loan plan fair? Sen. Chuck Schumer, who works the night shift as head of the Democratic Senatorial Campaign Committee, was a glass-half-full guy, predicting that six months from now voting for the new health care bill would be a political plus because "... the parade of horribles ... will have vanished." Tea Party star Sen. Jim DeMint, R-South Carolina, said, "We'll find out in November who won or lost this battle," noting a new CBS poll showing more than 60 percent of Americans want the GOP to keep challenging the new law. One has to wonder whether some of that 60-plus percent are health care reform supporters who assume GOP criticism will backfire at the polls. Mississippi's Republican Gov. Haley Barbour wins top sound bite billing for his colorful explanation of why the federal government has no authority to force Americans to buy health insurance "any more than in the name of homeland security they can force every American to have to buy a gun." Almost-civility reigned across the Sunday broadcast and cable spectrum. Sens. Barbara Mikulski, D-Maryland, and Lamar Alexander, R-Tennessee, disagreed quite agreeably about various aspects of the new law, in particular its affect on student loans. Mikulski pleaded for respect and decorum so the American people will take Congress seriously. She also wants an end to a system that "enables you to raise a lot of money after using outrageous and bizarre behavior" -- an idea that would likely mean an end to reality shows as well. Alexander was less inclined to play nice after the White House announced more than a dozen recess appointments, which is basically governance code for getting your nominees into office while Congress is gone. It's a tried-and-true maneuver used by both parties, especially when they have controversial nominations glued to the bottom of the Senate's in-box. Axelrod used the "Republicans made the president do it" defense. Particularly perturbed about the recess appointment of union lawyer Craig Becker to the National Labor Relations Board, Alexander accused the president of throwing fuel on the fire.